I was staying at the Snow Hotel in the Seocho district and took the metro from Nambu to the World Cup Stadium station. It’s easy to reach the Seoul World Cup Stadium. 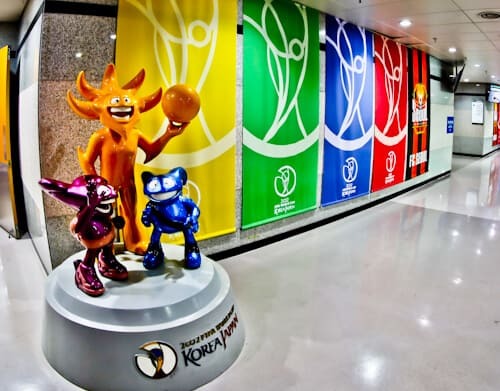 You must take the Seoul metro to the World Cup Stadium station (619). When you exit the metro you’ll see the huge stadium. The entrance to the stadium tour is located in W section of the stadium on the bottom floor. This is the opposite side of the Metro exit so you must walk around the stadium. As you walk around you can take some good photos of the stadium exterior. In addition, there is a shopping mall, supermarket as well as a food court inside. Welcome to the second largest stadium in South Korea! 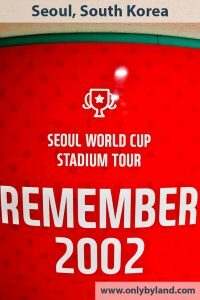 The Seoul World Cup stadium was impressive in 2002 and it remains an impressive stadium today. In fact, it’s still frequently used as the home stadium of FC Seoul. The capacity is over 66,000 spectators. The design is unique and was inspired by the shape of a traditional Korean kite. As part of the stadium tour you’re free to explore the whole W stand and take as many photos as you wish. In 2013, Psy performed a concert here to over 50,000 spectators. Photos from this concert can be seen in the stadium tour waiting room. Of course he performed his Gangnam Style hit, as well as Gentleman. As part of the stadium tour you can visit pitch side. 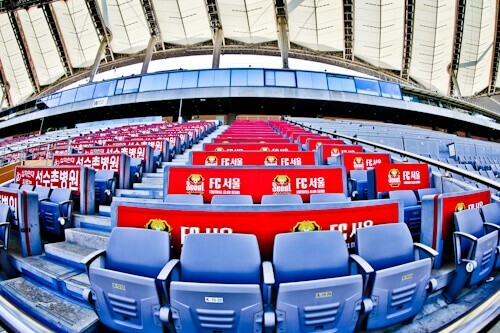 This is where legendary Dutch manager, Guus Hiddink sat when he managed South Korea in the World Cup semi final. The German manager in this game was Rudi Voller, Germany went on to win the semi final 1-0. This World Cup semi final was the most important game to have been played in this stadium. The media area of the stadium has been upgraded since the World Cup. It’s not as modern as the Besiktas stadium in Istanbul but it’s a nice bright part of the stadium with the FC Seoul colors. Additionally you can see the VIP boxes and other VIP seats. Can you remember the World Cup 2002 mascots? They were Ato, Kaz and Nik, collectively known as the Spheriks. You can take your photo with the Spheriks and the World Cup colors in the background. An interesting fact about the Spheriks is that their names were chosen by McDonald’s customers before the competition. 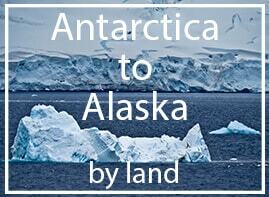 They are in fact futuristic characters, perfect for this part of the world. Furthermore, the 2002 World Cup was the first to be held in Asia. You may sit and take your photo with your favorite South Korean legend footballer. Ji Sung Park is a popular choice! 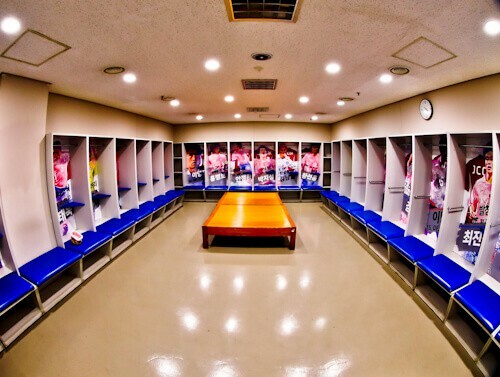 The fact that they have legend posters on the lockers shows how special the World Cup was to South Korea. Several years after the event took place, they still have pictures of their world cup team in the dressing room. Rightly so in my opinion, these players became legends by reaching the semi final and it’s something they have failed to do in the last few World Cups. 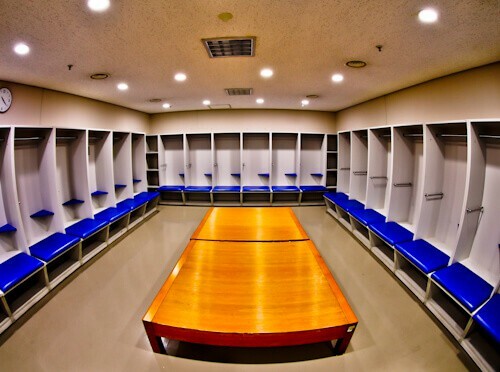 The away team dressing room is identical to the home one. There is one major difference though, there are no decorations or player poster inspiration. The home team will be motivated by the greats who have played there before them. In contrast, the away team will have no inspiration, a cold feeling. 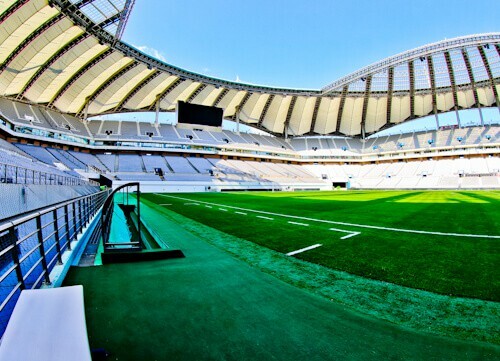 Add this to the fact that the fans will not be on their side either, this makes the Seoul World Cup Stadium and intimidating venue! 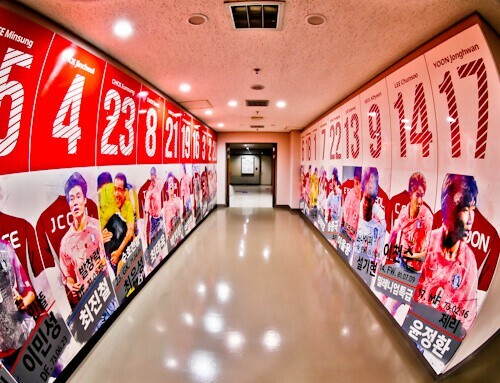 As you walk through the players tunnel, there are images of Korean legends. For the home team this is motivation, for the visiting team of course, intimidation! 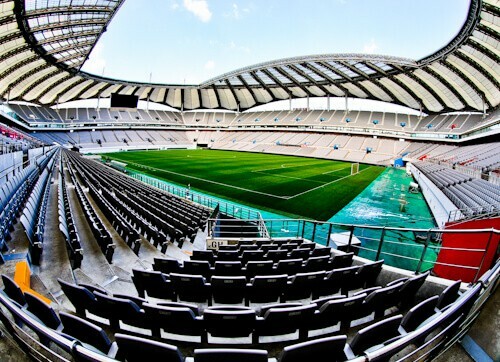 South Korea always qualify for the World Cup and they play their home games here. 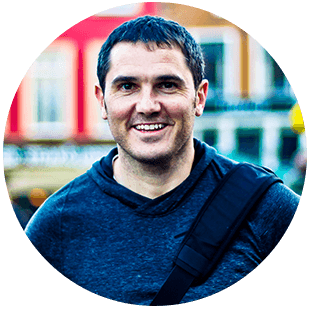 Visiting Asian teams struggle playing here and the South Korean team are proud to intimidate them with their past dominance. 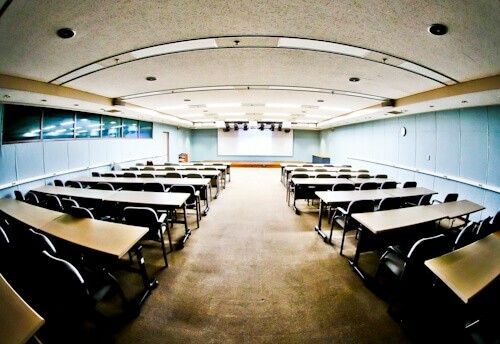 As you end the tour you may visit the press room. You can take your photos in here and they will play a World Cup 2002 highlights video. Do you remember what happened in this World Cup? The opening game was played here and reigning champions France lost to Senegal. Eventually Brazil went on to win the competition. In addition, there is an interview board you can get a photograph with as well. 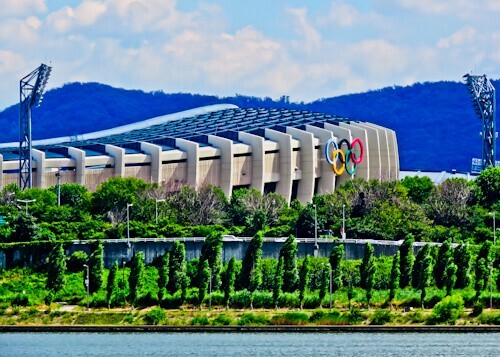 The largest stadium in South Korea is the Olympic stadium. South Korea hosted the Summer Olympics in 1988. The capacity is almost 70,000 therefore just a little more than the Seoul World Cup stadium. Unfortunately there is no stadium tour, nor can you freely enter. For this reason you can only enter when there is a football match on. It’s the home stadium of Seoul E Land FC and watching this team will gain you access to the stadium. Additionally, concerts are held here. Michael Jackson famously performed here in 1996 and 1999. Enjoy your visit to the historic World Cup stadium. The price for the tour is less than a dollar, additionally, it’s quiet so you’ll likely have the stadium to yourself! It’s the perfect way for football fans to spend a couple of hours in Seoul! 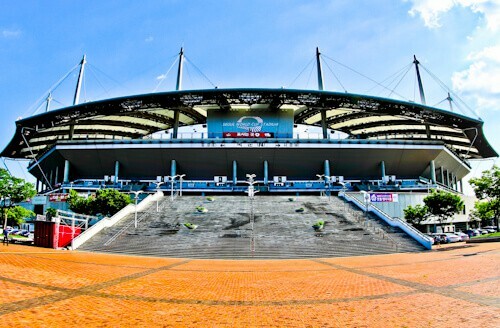 Take the Rajamangala Stadium Tour, the biggest stadium in Thailand. Check out the Instagrammable Snow Hotel in Seoul.